The Council is having discussions on how to fund the park improvements recommended by the Parks, Open Space and Trails (POST) Committee. The POST Committee presented the costs for various components of the park improvements on July 12th. Bruce Kimmel, the Town’s Financial Consultant presented ideas on how to finance the improvements (PDF 105kb) for the Council’s consideration on July 18th. Additional details on costs can be accessed from the Planning Departments page on the Town’s website, www.basalt.net. The P&Z recommended that the Council approve amendments to the CSC Zone District to implement the recommendations contained in the Our Town Master Plan Amendment for the four Our Town parcels. The Council will be considering the amendments in the near future. Read the “Proposed Amended CSC Zone District” document (PDF 1.1 MB). P&Z Work Session with Town Council on Tuesday, May 3rd at 6:00 p.m. The Planning & Zoning Commission presented a status update of the Amended CSC Zone District to the Basalt Town Council. The CSC Zone District concerns the Our Town Planning parcels. There was a public meeting regarding the proposed River Park improvements on March 14th. The Town has commissioned a model depicting proposed (and interchangeable) development options for the CDC parcel, along with the proposed park improvements. 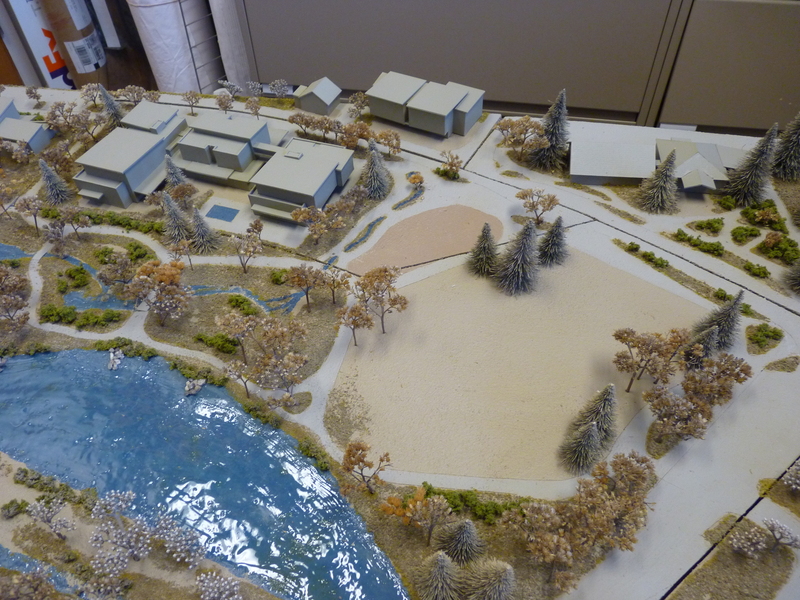 The model is now on view at Basalt’s Town Hall. The P&Z is in the process of reviewing zoning options for the Our Town Planning properties using a work session format. Click here to see the schedule. Here are the latest diagrams for the River Park. POST reviewed these drawings and there is only a small tweak to landscaping at the corner of Midland Avenue and Two Rivers Road that they requested. POST is presenting the river park plans to the Council on February 9th. The goal is to have an Open House for the public to review the plans at a date yet to be determined. On October 27, 2015 the Town Council listened as Bruce Kimmel, financial consultant, presented findings regarding different potential development options for the CDC parcel. This presentation was in response to Basalt Town Council Resolution No. 34, series of 2015 requesting redevelopment analysis and fiscal context. Click here to download the Powerpoint presentation. As a follow up, the Town Council held a work session on November 10, 2015 to review additional information prepared by Kimmel. Click here to download a copy of that report. On October 20, 2015, the P&Z held a public hearing regarding adoption of the Our Town Subarea Plan amendment to the 2007 Basalt Master Plan. After a brief presentation by Town Staff and Tim Malloy, land use consultant, and after hearing testimony from the public the Planning and Zoning Commission adopted this Master Plan Amendment by a vote of 5-0 via its Resolution No. 01, series of 2015. A copy of the resolution can be viewed here. 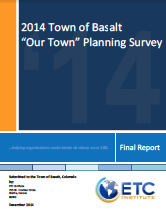 The Our Town Master Plan Amendment (Amendment) is a formal amendment to the 2007 Town of Basalt Master Plan and is intended to provide broad, overarching guidance for future development within the area referred to as the Our Town Planning Area (OTPA). The Amendment document includes a brief summary of the Our Town Planning Process and incorporates the Downtown Area Advisory Committee (DAAC) Report, which encapsulates the findings of the initial phase of the community outreach process for the OTPA. The Amendment also includes a revised Future Land Use Map (FLUM), revised Typology Map and typology description sheets, as well as several other recommendations and implementation measures intended to provide a course of action for achieving the intent described in the DAAC Report as well as other planning objectives for the OTPA. The findings and recommendations contained in the Amendment are intended to be used in conjunction with the policies and recommendations of the existing 2007 Basalt Master Plan and other adopted master plans for future planning purposes and for the purpose of evaluating development proposals within the Our Town Planning Area. It’s important to know that the Our Town Master Plan Amendment is separate from the work being done to analyze the square footage, building massing, and specific uses that could occur on the Riverfront, Lions Park and Merino Park (former recycle center) parcels, which is ongoing. Options 3.E.2 and 3.E.1 The P&Z’s iterative process concluded with a potential massing and building plan as shown in Options 3E.1 and 3E.2. Option 3.E.2 (PDF–20MB) is the same as Option 3.E.1 (PDF–20MB) except that it includes a 2,500 square foot building in the polygon area. Option 3E shows one potential combination of land uses on the three parcels. The P&Z also identified other acceptable uses as a step toward development of zoning for the area. The P&Z is looking at zoning options for the Our Town Planning area. See work session Our Town Planning Zoning Options (PDF 160kb). The Planning and Zoning Commission reviewed several development options during their May 19th work session. The P&Z preferred options 3C, 3E, 4D and 4D-modified and asked that these options be refined for the June 2nd public hearing. The refined options for 3C, 3E, and 4D were presented below for the June 2nd public hearing. At its February 23rd meeting, the Basalt Town Council adopted Resolution No. 09, Series of 2016. This resolution provides direction to the Planning and Zoning Commission, Lowe Enterprises and the Roaring Fork Community Development Corporation. During a regularly scheduled meeting on January 26, 2016 the Basalt Town Council was presented with a signed citizens petition regarding the purchase of the CDC property for $3 million. At its next meeting on February 9, 2016 the Basalt Town Council adopted Resolution No. 04, Series of 2016 in response to the citizen petition. On November 24, 2015 the Town Council adopted Resolution No. 54, Series of 2015. This resolution amends the 2007 Basalt Master Plan to include the Our Town Subarea Plan as a supplement. The Subarea Plan includes text and maps replacing and superseding portions of the 2007 Basalt Master Plan relating to the Our Town Planning Area. Also at its November 24th meeting, the Basalt Town Council adopted Resolution No. 55, Series of 2015. This resolution provides additional direction to Staff, the Planning and Zoning Commission, POST Committee and Roaring Fork Community Development Corporation. On September 25, 2015 the Town Council adopted Resolution No. 49, Series of 2015. This resolution clarifies the status of the Town Council’s decisions on development intensity for the potential building area identified in Resolution No. 19, Series of 2015. The Town Council voted to reconsider Resolution No. 43 Series of 2013 at its August 25th meeting. The Town Council then approved that Resolution Resolution No. 43, Series of 2015 approves a pre-development agreement with the Roaring Fork Community Development Corporation and Lowe Enterprises related to Downtown development. At its July 28th meeting, the Basalt Town Council adopted Resolution No. 34, Series of 2015. This resolution acknowledges the contributions of the Planning and Zoning Commission and POST Committee and directs further action. At the April 28th Council Work Session the Council adopted Resolution No. 19, Series of 2015. This resolution identified a potential “buildings and park plan” for the CDC parcel and directed Staff to advertise additional meetings for public input. Table 1 shows the current activities and identifies the party responsible for them (for example the P&Z was identified as the party responsible for amending the Town’s Master Plan). Staff plans on updating the information provided on Table 1 and presenting it in the weekly planner’s report and updating it here on this webpage. On January 27, 2015 the Town Council adopted Resolution No. 3, Series of 2015. This resolution accepts the DAAC Report and identifies the “next steps” in the Our Town Planning process. May – June : Site grading continues; Final flood elevations RFCDC site June – July : Planting, seeding, and irrigation (top) July – September : Establishment period continues September – October : Limited and cross access easements through the RFCDC site October : Final development and Park plans for community and then Town Council to review. Integration and update of the Two Rivers Road plan.